This is Pirdeus and he’s learning to write at a Liquid Future. Several of the children who attend classes at a Liquid Future’s new learning centre don’t attend regular school in the mornings. 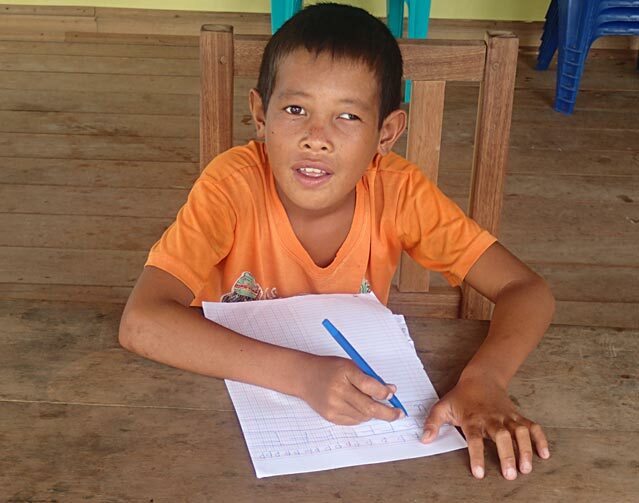 This can be for several reasons – they have been expelled, they have to work on their land or in Pirdeus’ case his family can’t afford it and he has never attended school hence his inability to write or read. However that is slowly changing. Pirdeus can write several letters of the alphabet, “P” seems to be his favourite and the one he’s best at. No guesses as to why! Attending classes allows Pirdeus an opportunity to gain skills, not only in writing, but his spoken English is progressing well too. These two skills could potentially help Pirdeus towards a much brighter future with his ability to speak English and interact with the ever-increasing number of tourists in Katiet providing him with avenues to pursue that he otherwise would not have. There has been an added bonus to Pirdeus learning to write. He has a lazy eye (as you can see from the photo). After practising writing for an hour his eye seems to correct itself for sometime after. Great results all round.